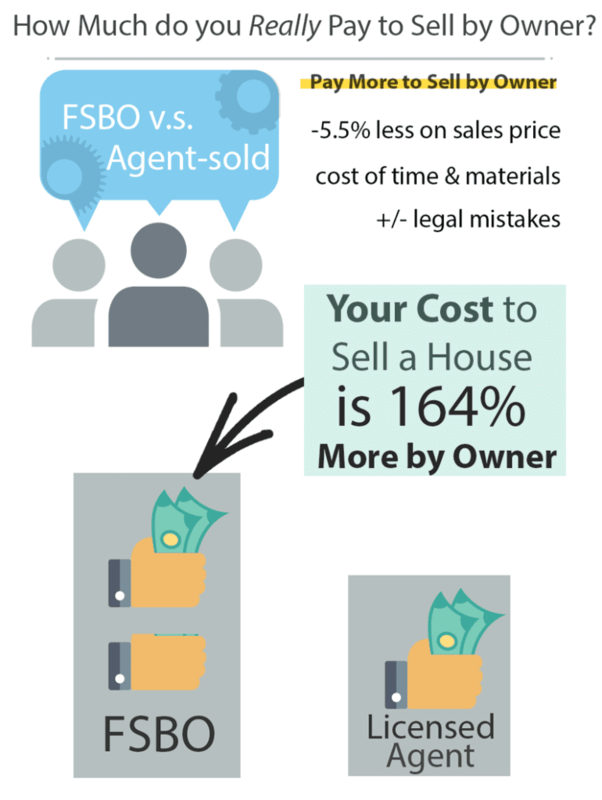 Infographic on what it would cost to sell my house by owner (FSBO). Let’s say that I’ve decided to sell my house. Now, I need to decide whether to use a licensed real estate agent, or sell my house by owner (FSBO). Many home owners decide to try and sell by owner due to the belief that it can save money. Furthermore, the most common reason cited is that home owners do not want to pay a selling agent’s commission. However, there are hidden costs to selling by owner I have found, despite the savings on commission. An study published by Drs. Sklarz and Miller in August of 2017 collected information on completed sales in over one thousand zip codes across the United States. Their goal was to compare home sales prices sold by owner vs ones sold using a licensed real estate agent. They hypothesized that for sale by owner houses, even with non-MLS website listing placement, would sell for “something less” than comparable houses and markets. However, the study by Drs. Sklarz and Miller did not address other costs I need to consider when I sell my house. I would like to call these the “hidden costs” of real estate transaction. The costs include items such as market research, open houses, advertising, and more. 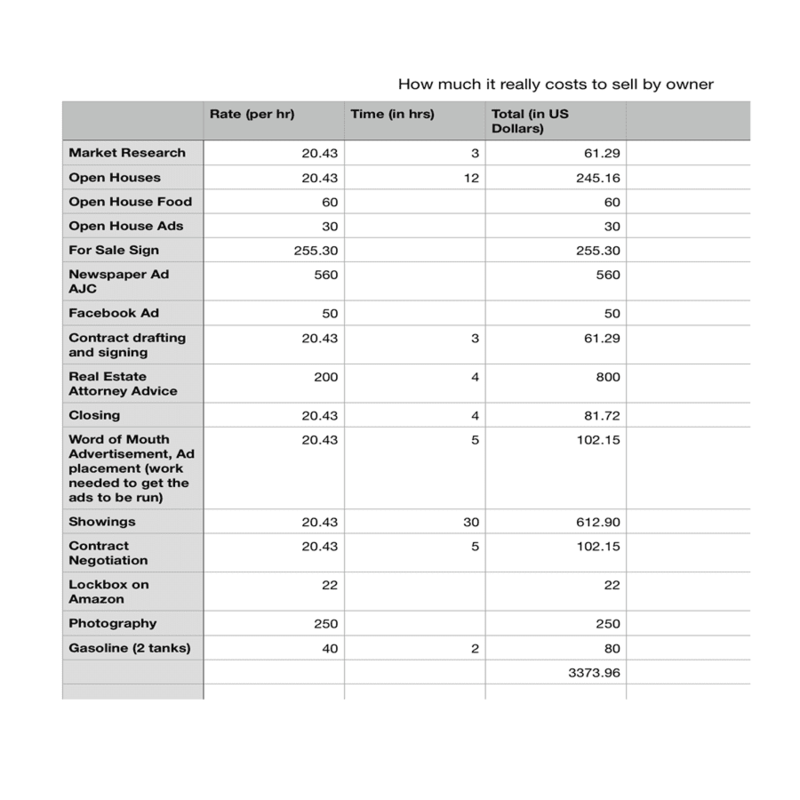 These are not costs I necessarily need to pay if I hire a licensed real estate agent. In addition to the hidden costs, commission to the buyer’s brokerage can still be considered when I sell my house. To begin with, the average home price sold in the United States was $264,800 in May, 2018 according to the NAR statistics. NAR is the National Association of REALTORS. From the same source, the average gross annual income for a real estate agent was used to calculate an hourly wage. The wage was calculated using a 40-hour workweek ($20.43/hr). Calculation of the hidden costs to sell a house based on NAR average home price and gross annual income for a real estate agent. The total amount that I, as a seller, do not pay to an agent to sell my house outside of a selling agent’s commission is $3,373.96. This amount is a calculation of the value of professional time and supplies as previously stated and shown above. Yet, it is actually more than this amount, because a FSBO home sells for 5.5% less in home sales price according to Sklarz and Miller’s study. The study states that 5.5% is “remarkably close to average commission rates.” If we use this amount stated in the study as an average commission rate, we will presume that the 50% of this number would be an estimation of the commission for a buyers broker. On our average home price of $264,800, the commission to a buyer’s brokerage is $5,958. This is usually paid by the seller. I am therefore paying a grand total of roughly $ 23,895 to sell my house by owner for an average-priced home in the U.S. Had I hired an agent and paid them the rate set in the study of 5.5% I would have only paid $ 14,564. This amount is 164% more than what I would pay if I, as a seller, had hired an agent to begin with, and just paid the selling agent’s commission! Legal fees from a mistake can also add to the cost to sell a house. Most certainly, this is true if the homeowner does not fully understand real estate law. What happens if there is a scam on the non-MLS listing website? What if you did something against real estate law? Licensed real estate agents are insured for these legal instances called E & O insurance. The financial benefits to selling a property by owner is clouded by a home seller’s initial desire to avoid paying a selling agent’s commission. The owners need to consider the time, knowledge, and materials needed to sell a house before considering selling on their own without an agent. FSBO individuals are paying 1.6 times more to sell the house by themselves, and perhaps much more if a legal problem arises. Hence, sound financial decisions based on hidden costs should be made before listing a house for sale by owner. Dollinger, Jane. “Existing-Home Sales Backpedal, Decrease 0.4 Percent in May.” Www.nar.realtor, National Association of REALTORS, 20 June 2018, www.nar.realtor/newsroom/existing-home-sales-backpedal-decrease-04-percent-in-may. “Quick Real Estate Statistics.” Www.nar.realtor, National Association of REALTORS, 11 May 2018, www.nar.realtor/research-and-statistics/quick-real-estate-statistics. Sklarz, Michael. “Saving Real Estate Commissions at Any Price.” Collateral Analytics, Collateral Analytics, 25 July 2017, collateralanalytics.com/wp-content/uploads/2017/08/CA-RESEARCH-Saving-Real-Estate-Commissions-at-Any-Price.pdf. This is really informative and helpful. It is definitely important to know how much it cost to sell a house to avoid mistakes in the future. Nice blog by the way and thanks for sharing! Thank you, Richard! Let us know if you are ever in the Atlanta area. We would love to meet you and show you some of the great technology we have to help sell!